Asian stocks started March on a weak footing after U.S. shares tumbled in afternoon trading Wednesday. Treasuries and the dollar steadied as traders awaited a second appearance from Federal Reserve Chairman Jerome Powell, whose comments riled markets earlier this week. Shares in Japan and Australia fell with materials and health-care stocks faring worst. Hong Kong and Chinese shares outperformed after the Caixin manufacturing gauge came in above expectations. Futures on the S&P 500 Index declined after the U.S. measure closed out its worst month in two years. The 10-year Treasury yield held just below 2.9 percent and German bund yields were little changed. Crude recovered slightly after plunging on an unexpectedly strong rise in inventories. The Australian dollar dropped and bonds rose after business investment unexpectedly fell in the final three months of last year, with forecast spending also lower than expected. 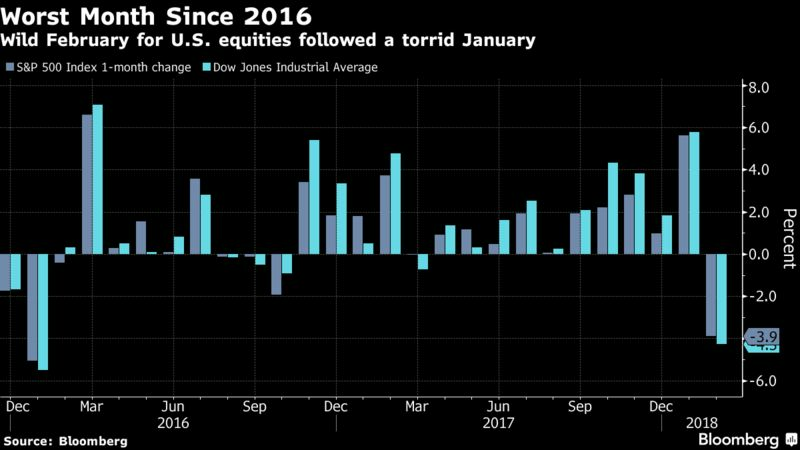 Equities continued to fall one day after major indexes dropped based on a generally upbeat assessment of the U.S. economy from Powell. His comments left investorswondering if the central bank planned more interest rate hikes than expected in 2018. Powell testifies before the Senate Banking Committee Thursday. Elsewhere, the U.K. pound pared a decline after the European Union published a draft Brexit treaty, with Prime Minister Theresa May squaring off for a fight. Bitcoin fell toward $10,000. Terminal users can read more in our markets blog. Fed’s Powell testifies before the Senate Banking Committee Thursday. Other Fed speakers this week are Bill Dudley. In the euro region, investors will be watching manufacturing and jobs numbers Thursday. U.K. Prime Minister Theresa May delivers a speech Friday on Britain’s relationship with the European Union. South Korea’s markets are closed Thursday for a holiday. The MSCI Asia Pacific Index fell 0.8 percent as of 4:37 p.m. Tokyo time. Topix index declined 1.6 percent. Hong Kong’s Hang Seng Index rose 0.1 percent. Australia’s S&P/ASX 200 Index declined 0.7 percent. The Japanese yen fell 0.1 percent to 106.78 per dollar. The euro rose 0.1 percent to $1.2207. The Australian dollar fell 0.4 percent to 0.773 per dollar. The yield on 10-year Treasuries rose less than one basis point to 2.86 percent. Japan’s 10-year yield fell one basis point to 0.046 percent. Australia’s 10-year yield fell six basis points to 2.755 percent. West Texas Intermediate crude rose 0.2 percent to $61.74 a barrel. Gold fell 0.3 percent to $1,314.60 an ounce. LME copper rose 0.2 percent to $6,944.50 per metric ton. FOMC wash up: more ‘as you were folks’?